Shrek The Third's download time is the longest of any game I've played, taking around three and a half minutes. Certain unnecessary features were included in the demo even though they aren't needed or (unless you out of your way) used. On the other side of the coin, the demo was easy to get at and set up for download. The menu system couldn't have been easier: when the main menu loads up, you can tap on "Demo" at the bottom center of the lower screen. Simple as that. Shrek The Third's demo is VERY easy to use, being very reactive to stylus movements and working appropriately every time. The demo includes in-game hints and guides you along with on-screen motion guides for the stylus. Watch your accuracy with Puss's jumping, but if you're on target, so is Puss. Visually, Shrek The Third features beautiful, dynamic 3D graphics and is set in an on-rails environment (you can go forward and backward through the story, but it's not an open, go-anywhere-at-anytime world). The level is actually the exact same introductory level you play in the main, single-player game and, as a result, accurately depicts the game visually. The upper screen is barely used (aside from hints). The ceilings, walls, etc. extend upward to include the upper screen, but no action takes place there. There is no sound in the demo. There are no selectable features available in the demo. As is always the case, my reviews here only discuss the Single-Card Download features of a game and never the single-player main game (there are plenty of sites that do that already). While I'm still not going to review the main game, in a departure from the norm, I will briefly discuss the main game. In Shrek The Third, you play through many of the events of the film in a 3D on-rails environment. The game, while not always challenging, is fun. The main game begins with an introductory level that teaches you the basic controls, which you then have to use to complete the level. Then the main game begins. While playing through the main game, that introductory level comes across as a brief diversion, but it fits in with the rest of the levels. 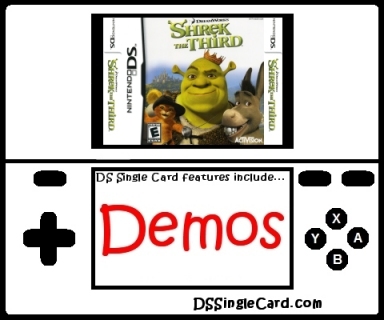 In the Single-Card Download demo of Shrek The Third, you play through that introductory level. My feelings about this are conflicted. On one hand, this is almost the ideal demo, the pinnacle of what the concept strives for: you play through a part of the actual game, you learn how everything works in the actual game, you see what the graphics and controls are actually like, and the demo is easy enough for you to succeed. On the other hand, there are two things missing here (besides the sound, which is probably due to the limited amount of download space). The first missing aspect is the fun: there are no enemies, thus there is no challenge and, when there is no challenge, there is no sense of accomplishment/satisfaction (read: "fun"). The second thing that is missing is a conclusion. When you play through this level in the main game, you then procede to play through the story and all of the other levels. When you complete this level in the demo, the game reverts to the opening credits and restarts the level. You're left with a feeling of "Ummm... did I win?" when the game tells you nothing. Something as simple as a screen of text that says "Congratulations. You've escaped!" or as corny as "Congratulations... now your quest can begin! Grab the game and start playing immediately; there's no time to waste!" would at least give a sense of accomplishment and a form of closure. That's the reason that Shrek The Third's demo is ALMOST the ideal demo - it's missing the one thing that would make it perfect: the ability to make players want to spend their cash on the game after playing the demo. Shorten the download times (perhaps resticting the number of downloads allowed at any one time). Include enemies (so that guests can experience that part of the game as well) and difficulty settings (which change the number of enemies). Allow several choices in which level can be downloaded. Supply a conclusion to the demo that entices the player to buy the game. Click here to return to the DSSingleCard.com Shrek The Third/I> profile.